Put me back in the water. I have had too many Cate vs asphalt encounters in my life to enjoy antics such as sea kayaking down the street. Some how the guys convinced me that I should be the test dummy for this little project. Yes, I was wearing my helmet. Ahhhh . . . rainy days don't get me down but our website being down might. 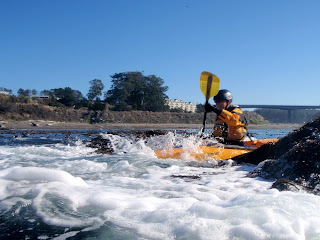 10 days ago our Liquid Fusion Kayaking website finally said "ENOUGH!! !, I am old and just can't take another update." 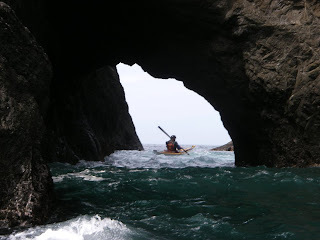 It still has our calendar, our Mendocino Coast sea kayaking video, and information about our classes, but the time has come for a new site. So this woman on water has been woman on the computer and has been consumed with rebuilding our site. 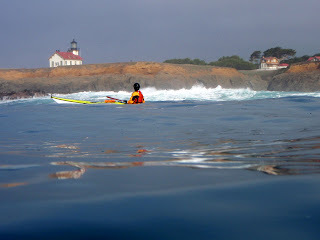 As I develop the pages, write the descriptions, and upload photos; I long for the water. I am getting excited about how the new site is looking but am anxious to launch it and to be able to get more time in on the water. Just finished reading the article from Newsweek titled "Why We Need More Time in Nature." I couldn't agree more and reading the comments posted indicated that many agree. Even more interesting would be research on why many of us feel such a draw and connection to water. Perhaps it is because our bodies are over 70% water or maybe that our planet is mostly made up of water and our lives depend so greatly upon it. Regardless, my recommendation is to get out there and enjoy it.